Following oil discoveries at the Liza, Payara and Snoek reservoirs from 2015 to present, ExxonMobil and its Joint Venture partners Hess and CNOOC Nexen will be looking to repeat these successes with exploratory drilling at the new Ranger-1 well site in the Stabroek Block offshore the South American country. According to a Notice to Mariners published in the Guyana press by the Maritime Administration Department (MARAD), drilling at the Ranger-1 well will commence on October 11, 2017 and will last a period of three months. The drillship Stena Carron has been identified as one of the vessels to be used during the operation. Other support services vessels identified are MV Cat Island, Mv Fast Titan, MV Hannah Chest and HOS Commander. The Ranger-1 drill site is approximately 160 nautical miles off the coast of Guyana and covers an area of one square kilometer. The drilling campaign set to begin at Ranger-1 follows similar operations at the Turbot-1 well located 107 nautical miles offshore, which began on August 14. On September 1, the company also began a 3D/4D seismic survey 86 nautical miles offshore within the Stabroek Block, over an area of 2,215 square kilometers. The PGS Hyperion, M/V Thor Assister and the M/V Thor Omega are involved this operation. 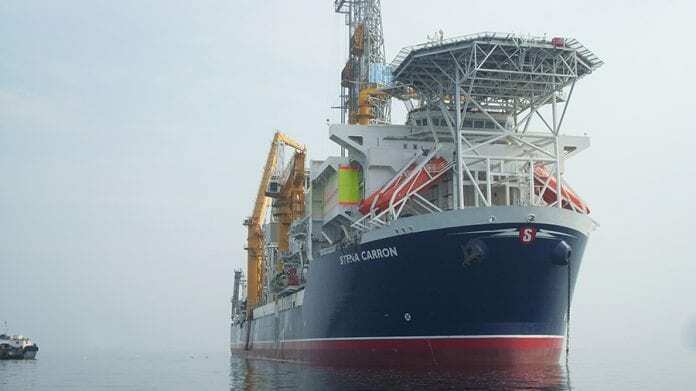 The US super-major has so far discovered significant recoverable reserves in the Stabroek Block, estimated to be as high as 2.75 billion barrels.